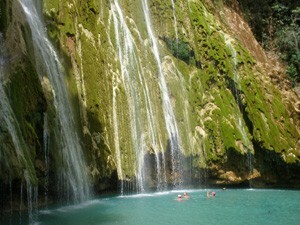 Cascada Salto El Limon Waterfall in Samana Dominican Republic. 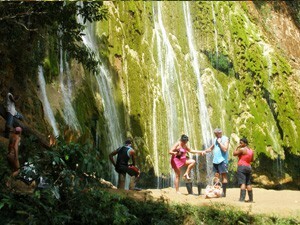 The Waterfall of Cascada Salto El Limon is located about 15 Kilometers from the Town and Port of Samana, about 45 Kilometers from the village of Las Galeras. There is a Restaurant located right at the entrance of the beginning of the trail. 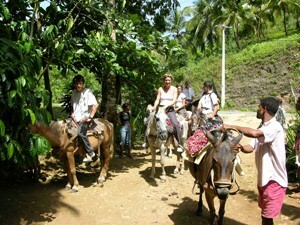 The Waterfall itself is very secluded and accessible only by Hiking (30 minutes) or by Horseback riding (15 minutes). 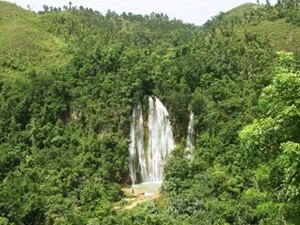 The landscape surrounding the region of the falls is picturesque. Small houses are painted in vivid colors and made from locally available materials such as palm wood and thatch. The area is predominantly agricultural, with home gardens and vegetable plots bordering plantations of banana, cacao, coffee and coconut. In the rainy season between May and November the trail can get pretty muddy and wet, so wearing good shoes and bringing rain gear is recommended. 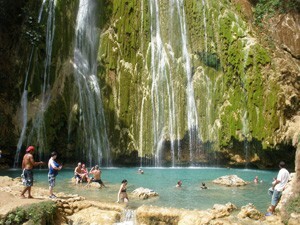 The Waterfall is about 40 Meters tall and falls into a nice natural pool of cool waters below, so be sure to bring your bathing suit to enjoy a refreshing swim. 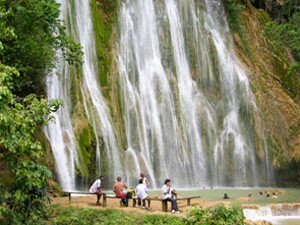 It is crucial that the watershed of Arroyo Chico, the river which plunges 40 meters down the falls is conserved to insure the long-term future of the falls and water supply for the communities, as well as the inherent biodiversity. So, please be respectful of the nature surrounding the waterfall. 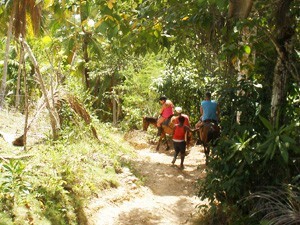 Although it is difficult to see the original vegetation from the road, fragments of humid subtropical forest is found along the riverbanks and trails to the waterfall. One may see native tree species such as Juan Primero (Simarouba glauca), Cigua Blanca (Ocotea coriacea), Uva de Sierra (Coccoloba diversifolia), Cabirma (Guarea guidonia) and the Palma Real or Royal Palm (Roystonea hispaniolana). The Royal Palm was becoming endangered due to uncontrolled cutting for house construction but is now officially protected in the Dominican Republic. The Cigua Palmera (Dulcus dominicus), a native heron, nests in this palm species.